Defy Stain costs about $40 per gallon. We used a little over 2 gallons of the light walnut color on our 400 square feet of IPE. Coverage for the Defy Hardwood is less than other exotic wood stains. No mold or mildew on the flooring surface or decking railings. A small amount was visible on the stairs. Defy Hardwood penetrates IPE extremely well without any filming on the surface of the wood. Coverage per square foot is less than an oil-based stain but similar to other water-based wood stains. We followed the manufacturer’s advice and used a truck brush for application. It was a little messy but it did apply evenly to the surface. One coat to the floors took less than 30 minutes. Defy Hardwood Stain did not darken in color. The procedure for reapplication consisted of a light cleaning with their Defy Wood Cleaner. Once dried after a few days, we reapplied one coat. We did not have any issues with the maintenance coat adhering to the first coat. Since the Defy Hardwood Stain had faded evenly without any peeling or darkening, it would be easy to apply a wood cleaner to prep the wood. Re-coating should not be an issue since the stain had penetrated into the wood. This is the second time we have tested the Defy Stain for Hardwoods and the results were similar to the first. It fades lightly through the year and can be reapplied without sanding or chemical stripping. For IPE wood this is essential for annual maintenance. UV Exposure: Full Sun, South East Exposure. *All products tested and results are from our experience as wood restoration contractors. We offer no guarantee of similar results. Take into consideration that results may differ due to different wood types, exposure to UV radiation, and natural weathering. After years of frustrating use of oil-based stains on my IPE deck, Defy Deck Stain for Hardwoods has proven to be dang close to a miracle. I have used Messmers, Australian Timber Oil, Penofin and several others. Despite rigorous prep, none of them lasted, all of them blackened and needed to be chemically stripped every two years. Mind you, I painted houses for several years so proper prep is a process well-known to me. None of the oil-based stains lasted. Defy is so user-friendly. I had chemically stripped the Messmers in July of last year. Defy was easy to apply and looked great. I scrubbed the deck with Oxyclean in October and put on another coat of Defy to get through the winter. It came through looking great. This past week, I scrubbed the deck again and touched up with Defy in heavy-traffic parts of the deck. It looks fantastic. No more chemical stripping, ever. Defy is water-based so it is very easy to apply and clean up. You do need to be careful with application as it will dry VERY quickly in direct sun/on a hot deck. All in all, I wish I had known about this product when the deck was built in 2006. Thanks for the review! Do you have any pictures? Rich, your deck looks great following your prep and staining with the Defy Hardwood stain. What color tone of the stain did you use? I am planning on installing a Cumaru deck next Spring (probably won’t prep and stain until the following Spring) and the Defy is very much in the running for what I will use for the project. Thanks for your post. A customer of mine has an outdoor shower on the shady side of his house that sees little if any sunlight. The enclosure and floor are untreated Ipe. There is a lot of green algae and some mildew. The floor gets very slippery. After washing with an algae and mildew cleaner I need treat the Ipe so that water sheets off so the structure dries and algae doesn’t grow. Would Defy Extreme be a good choice for this project, or is there something better? Thanks! No stain will work for an outdoor IPE shower floor. It will wash off. How about the shower enclosure? Hello: great web site, very informative. Your site is fantastic. Like so many others, I wished I would have found it sooner, although I have stumbled upon many of your basic teachings by years of mistakes as well as trial and error. I am planning on replacing my Cedar deck next Spring with Cumaru (probably won’t prep and stain until the following Spring to allow wood to season). I am in Michigan and although parts of my deck are exposed to direct sunlight at times during the day, much of the area is shaded by trees. The surrounding trees also drop a fair amount of organic matter on the deck throughout the year. Defy is very much in the running, but I am also considering Ipe oil, Mesmers, and Armstrong. I have a few questions. 1) Given the conditions I describe, which product do you think is best suited? 2) Of the Defy and Armstong, are there color shades more or less likely to show staining from surrounding trees? 3) For application and wear issues, which tops the list? 2. Darker colors may help some but will not hide all. 3. Both can be cleaned and reapplied as needed. This will need to be done annually for your wood type. Thanks for the guidance. Much appreciated! I have a new, clear cedar deck, and want to use a water-based stain. Would the Defy Hardwood or the Defy Extreme be more appropriate? The Defy Hardwood will soak in better. Would this be a good product for my new (in March) cedar fence in Seattle? West facing, full sun in summer. Lots of rain as well. I’m looking for semi-transparent, lower maintenance, cedar color (not orange). Thank you! Yes, this is a great product for your fence. Cedar colors in deck stains are orange though. Light Walnut may be a better option for you. Thanks very much. 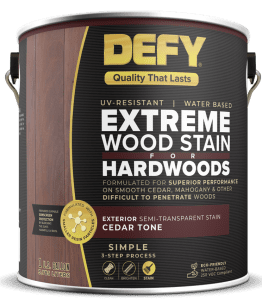 Would the Defy Hardwood version definitely be better than Defy Extreme? Actually, on a fence, the Defy Extreme would be your best option. More colors as well. Does this require a wet on wet application, or is it a one coat application not requiring wet on wet. Depends on the wood type you have and the age of the wood. I’m planning to use Defy for Hardwoods on my mahogany deck. I sanded, cleaned and brightened it. Your review says to only use one coat on hardwoods, but the the product info says 1-2 coats on exotic hardwoods. What to you recommend for mahogany? Depends on how porous the wood is but more is not better. Try the one coat to be safe. We have a deck made of larch wood. The deck is 2 years old and the lumber yard applied a clear coat protective finish which didn’t last long. The wood has grayed and where the metal spindles connect into the wood it has turned blackish. What would be the best cleaner/restorer? What would be the best sealer to use? I would like to use a water based sealer. Would the Defy for Hardwoods be best? I like the review of the RAD Wood stain as it can be applied damp and would prefer to use that if it would work well on the larch. Thank you! Try stripper and brightener for prep. You need to make sure the clear sealer is removed. Either RAD or the Defy Stains would work well for this. Whatever you prefer. We have powder coated aluminum spindles on this deck. What stripper and brightener can be used without harming the finish on the spindles? Thank you. Hard to say 100%. Best to test first to see a reaction or not. Most likely no. 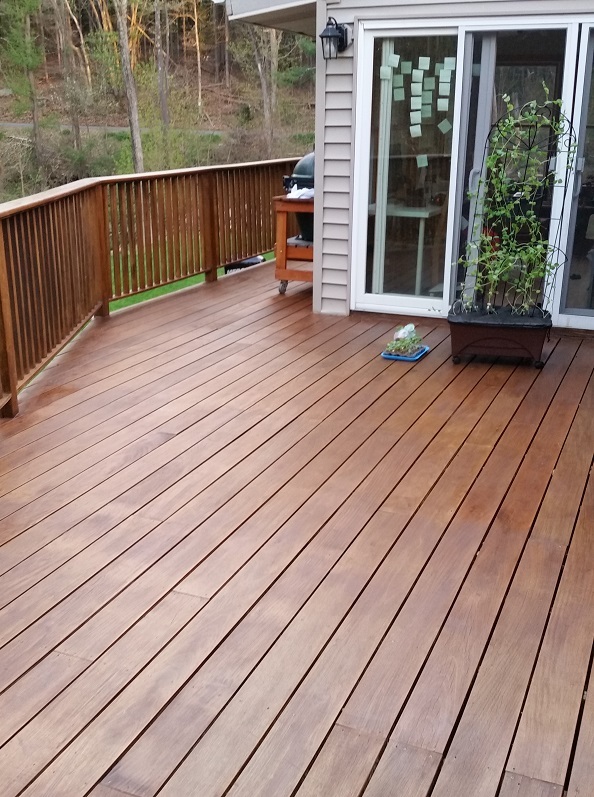 Erik, no brand of semi-transparent deck stain will be Bleach or harsh chemical resistant. The plywood should be enough to protect the wood underneath. Merilee, it will be hard to match two different wood types and especially when you have older and newer wood. Make sure the prep is done correctly as that is key. Use the Defy Wood cleaner for the prep and the Defy Wood brightener when done with the cleaning. Once the prep is done then you can use the Defy Hardwood stain. I'm having a new IPE deck been built next to a pool over a concrete subfloor with good drainage. Should I seal each board on all 4 sides before installation? Then after its installed should I use the brightener and seal the top again? No need to stain all sides. Just install, wait a couple of months, clean and brighten for prep then stain. I applied Defy for Hardwoods last month. I used the cedar color which turns out to be actually ugly ORANGE on white cedar. It also is sticky in places. I suspect that the two solid weeks of rain beginning the day after application might be part of why. It should not be sticky by the Spring. Sticky means it was most likely over applied. I believe you can clean and reapply a different color as long as the next color is darker. You can go darker but you cannot go lighter without stripping. Usually we would do this after 2-3 years and we know then it will take. doing this after 6-9 months may be an issue so might want to contact them for advice. I stripped my deck with defy stripper and most of the stain came out but there are numerous spots especially around the knots in the wood. It was a lot of work. I used a powerwasher to get it off . What do I do now with all the spots which are now actually darker than the stain was. You could try sanding or make sure that your new stain will blend it all together so it does not show when done. Did you use the Defy Wood Brightener? Did not use the brightener yet because I didn't know if I would need to do the stripper again. Will the brightener help with the spots? Also, I am not sure how to blend in the stain to hide the spots? The spots are also much darker than the stain was – is that from the chemical reaction from the stripper? Stripper in general raises the pH level of the wood and darkens the wood\’s appearance. Brightener lightens it back. Feel free to post a picture in our forum if you would like us to view. Thank you . How do I post picture here. I have a Mahogany deck that was stained with a Cabot wood stain that did not perform well. I have stripped and neutralized and am ready to stain. Most recommendations for a hardwood stain on this site are split between Defy Hardwood and Armstrong. Are there conditions under which Defy or Armstrong would perform better that the other? My house is in SE Pennsylvania, is totally surrounded by woods (and therefore enjoys a damper atmosphere), and enjoys mostly sunny, but partly shade conditions. Would the damper atmosphere cause me to lean toward water-based Defy? Yes it your deck attracts mold. What was the issue with the Cabot? I had it done by a contractor who was recommended to me before I learned of this site. He power-washed it and applied the Cabot. The first time he did it, it looked OK for one year but the second time, it looked all mildewed and moldy within three months. I suspect he did not wait long enough after power washing before staining it. And I also suspect that he used plain water to power wash (with nothing to kill the mold and mildew). And finally, I think Cabot changed its formula. Now, I have used a stripper (and a fair amount of elbow grease) and a neutralizer and it now looks very good. My hope is that, going forward, I can use Defy Hardwood Stain and only need to neutralize and apply a maintenance level of stain on the horizontal boards annually, every two or three years for the vertical spindles. Is that a reasonable expectation? You have to clean and brighten for future prep, not just brighten (neutralize). According to the Defy website you just need to brighten. "It may be beneficial to use DEFY Wood Brightener to clean and brighten the surface before the maintenance coat. " I spoke with one of their customer services rep and he confirmed this. Is it possible that their brightener has some cleaning agents also. No it does not have any cleaning agents. We would still clean and brighten. I've just expanded an ipe deck which was about 7 years old, adding about 50 sq ft of area to the deck. I've pressure washed the whole deck so it seems to be quite ready to take the stain. My question is whether or not I need a sealer. My neighbors (who have the same decking, as it was the same builder originally) said that they had a contractor come who "added some stain to the sealant" which he applied. Without sounding like an idiot, is the Defy all I would need to apply to my freshly-cleaned decking? Yes that is all you would need. 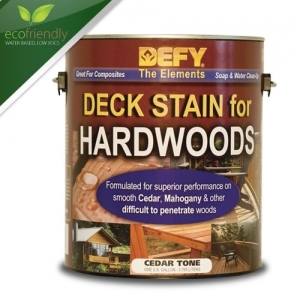 We've been using Defy Deck Stain for Hardwoods for 7 years on our red cedar deck. This deck gets pounded pretty hard with long days of direct sun in the summer and a lot of cold / wet / snowy days in the winter (Pacific NW near Puget Sound). It holds up better than described in the test results in this review. No peeling; just slow, very gradual fading. A few areas show mild weathering, but no mildew at all (and our area is notorious for mildew and mold). We get more than 1 year out of the first coat on the horizontal surfaces and a 2nd year+ by first applying Defy Wood Cleaner before re-coating. We have no issues at all with re-coating (as long as you only apply one coat). Most vertical surfaces hardly need touching up even after 3 years. Of all deck stain products we have used over the last 25 years in two homes, Defy is the unquestionably the best. Just be sure to follow the instructions exactly. thank you for this encouragement. I can now feel good about going forward with it for my Seattle deck of cedar that will be covered. 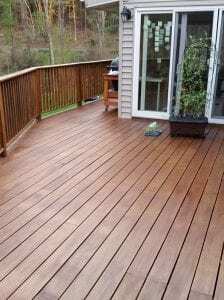 How long had your deck been drying before application of the cleaner and brightener? Sorry about taking so long to get back to you. I wasn't aware of your reply / question. I've never used DEFY Cleaner. I use their Stain Stripper and Brightener before re-doing the stain. The Stripper can be used at any time and the deck should be slightly wet. It is important to apply the Brightener immediately after the stripper so the stripping chemicals get fully neutralized before allowing the wood to dry. And, use plenty of water to eliminate the Brightener after it does its work. Could you tell me what color hardwood stain you have been using for your cedar? I'm trying to decide between the pine and the light walnut for a new cedar deck. Thanks in advance! I want to create a 2-tone pergola deck. Pine is on the floor and I think I like the color of Defy Light Walnut for that. The pergola on top is cedar and I'm leaning towards the butternut color since it is darker. Since butternut isn't available in the Hardwoods color would the regular Defy Extreme be ok for the cedar? Or should I use the Defy Hardwood for the pergola and settle for Light Walnut? I know the cedar will be darker so it will automatically give it a little bit of a two tone look, but with walnut and butternut the contrast would probably look better. Yes the pergola cedar will be fine with the Extreme Butternut. After sanding you should clean and brighten the wood fore additional prep on the floors. This will allow the stain the penetrate deeper. Yes just one coat – is the stores recommendation to sand and put on another coat feathering it a good idea – they said not to power wash it. Note – the peeling is down to the very surface so you can now see the bare cedar wherever it peeled. I would not sand. That closes to wood pores so the stain absorbs even less. Best to strip and brighten. Might want to get some tech help from the manufacturer. Saversystems. We used Defy for hardwood light walnut last year – we had a very rough winter and this spring after the snow melted there are numerous places on the deck that are peeling. We checked with the store we purchased the product – their advice to us is to lightly sand using 80 grain and put another coat on the floor feathering it – the railings are just fine. They said they believed the Cedarwood which was about nine months old at the time must not have been dried out enough to properly absorb the stain and that could be why we have so much peeling. I would be interested in your thoughts on this. Deb, peeling is usually the result of not prepping correctly or over applying. If the Defy is unable to penetrate then it can film on the wood surface. Did you only apply one coat to the new wood as directions state?